NET-EN affects bleeding patterns less than DMPA. NET-EN users have fewer days of bleeding in the first 6 months and are less likely than DMPA users to have no monthly bleeding after one year. Requires action only every 2 or 3 months. No daily pill-taking. DMPA is now available in a special formulation, called DMPA-SC, that is meant only for subcutaneous injection (just under the skin) and not for injection into muscle. 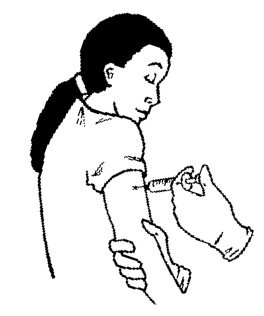 Subcutaneous injection is easier to learn than intramuscular injection. DMPA-SC is available in two injection systems—in the Uniject device and in prefilled, single-dose, conventional syringes. Both have short needles meant for injection just below the skin. With the Uniject system, the user squeezes a flexible reservoir that pushes the fluid through the needle. DMPA-SC in the Uniject system is marketed under the brand name Sayana Press. This product may be particularly useful for community-based programs. Also, women can easily learn to give themselves subcutaneous injections with this system (see instructions).